It might be common knowledge to developers, but some readers might not be aware that Apple only permits developers to sell apps at certain price points. For example, customers in the US App Store will see apps costing $0.99, $1.99, and $2.99 but they won't find any apps costing $5.20 or $2.75. For various reasons, which we'll cover, Apple permits developers to choose from 94 price tiers, which range from US$0.99 to US$999.99. Developers pick one price tier, which applies to every country that their app is distributed in. In this story we'll go into the details of the App Store price tiers, explaining how they work, some of the reasons why they exist, interesting consequences of them, and hear from developers who use them. This is a bit of an experimental story, exploring an iOS/Mac developer topic for the benefit of anyone interested in the iOS/Mac app ecosystem. If enough people find this useful we'll look at covering other topics. The first thing to be aware of is that Apple takes a cut of every purchase made through the iOS or Mac App Store, whether it be a paid app, in-app purchase, or in-app subscription. Apple's cut is 30% and this has been the case since the App Store opened in 2008. That means that when a customer buys a $0.99 app, the developer of that app is actually only getting 70 cents.1 In fact realistically it is usually even less, because in many countries Apple is required to withhold a further percentage as a consequence of domestic taxes. Apple's 30% of all purchases through the App Store is a straightforward and universal policy – the amount does not change based on popularity, size of the app, or who the developer is. Aside from annual developer registration fees ($99 for an individual), Apple does not charge developers anything for hosting free apps. Technically speaking, when developers submit their apps to the App Store, they do not choose a price for their app – they choose a price tier. There are 87 price tiers and 7 alternate price tiers (which we'll discuss later) for developers to choose from. Each price tier corresponds to a different price that the app will sell for on the App Store, which in the US ranges from $0.99 to $999.99. In the US App Store, the first 50 tiers increase in value in $1 increments from $0.99 (tier 1) to $49.99 (tier 50). Beyond tier 50, the prices increase in an accelerated nature, with the last 5 tiers increasing in $100 increments (e.g. $899.99 to $999.99). Beyond just limiting developers to specific prices that Apple approves of, the price tiers do serve one vital purpose: simplifying the global pricing process for developers. It's easy to forget that the App Store operates in a lot of countries – as of today, the number stands at 155 countries. What makes operating in that many countries challenging is that most of them have their own currency, which would significantly complicate matters if developers had to provide a price for every country that they offered to sell their app in. So each price tier has seperate prices for every currency, whether it be US dollars for the US, Australian dollars for Australia, British Pounds for the UK, or the Yuan for China. You can see in the above table that price tier 10 is USD$9.99, AUD$12.99, £7.99, and ¥68. Importantly, the value of the price tiers in each of the different currencies are roughly equivalent in value. But currencies fluctuate in value all the time, so they will rarely be exactly equivalent. Historically, Apple has intervened on a few occasions to adjust the value of price tiers in some countries to reflect a persistent and substantial change in a currency's value. For example, in January this year, Apple adjusted the price tiers in Europe and Canada to reflect the weaker British Pound, Euro, and Canadian dollar. It's a challenging game to keep ahead of fluctuating currencies, as you can see from the above graph which shows the last 6 months of the Australian dollar against the US dollar. The blue bars indicate the exchange rates that Apple has adopted for the various price tiers and you can see that at different points over the last 6 months, Australians have been getting apps relatively cheaper (when the blue is below the green) and at other times for relatively more than those in the US. But on the whole, the 6 month average is reasonably close to the exchange rates that Apple has set. You might also notice that across different currencies and price tiers, Apple tries to stick with "clean" and consistent numbers where possible. For example, across most countries where the price goes into decimal points, you'll see that Apple tries (where possible) to end it with 99 cents, or alternatively, 9 cents. By using clean numbers, Apple's conversion rate back to the US dollar varies slightly across different tiers – which is why there is a seperate blue bar for the different tiers on the above graph. To the consumer, the variation is insignificant but it is an interesting consequence of Apple's obsession with using "clean" numbers in every region, not just the US. Prior to the introduction of the alternate price tiers in mid-2013 (and further expansion this year), another consequence of the price tier system was that it prevented price discrimination across regions.2 Developers can only choose one price tier which will apply to every region in which their app is sold and Apple ensures that prices in different currencies for the same price tier are roughly equivalent. However, with the introduction of the 7 alternate price tiers, some degree of price discrimination is explicitly intended. Alternate Tiers A and B have specifically been introduced allow developers to charge lower prices for developing and emerging countries including, but not limited to, China, India, and Indonesia. For example, Alternate Tier A allows apps to be sold in China for ¥1, which is equal to approximately USD$0.16. 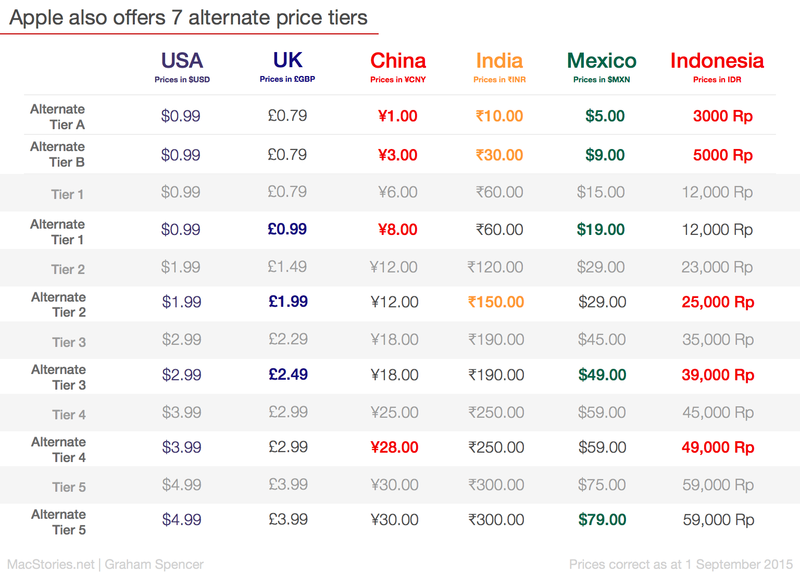 Alternate Tiers A and B do not change prices in the US and other developed markets, (in those countries the prices match Tier 1, e.g $0.99 in the US). You only need to take a quick look the top paid charts on the App Store for China to see that the Alternate Tier A is incredibly popular amongst the top-charting apps. 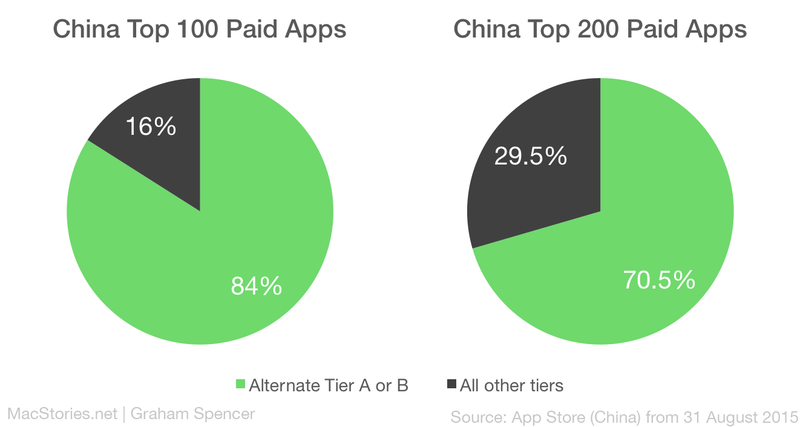 A whopping 84 out of the top 100 paid apps use Alternate Tier A (1 yuan). If you look at the top 200, 140 use Alternate Tier A and 1 uses Alternate Tier B, for a total of 70.5% using the Alternate Tier A or B. By contrast, Alternate Tiers 1 through 5 round up some of the prices in Tiers 1 through 5, in various countries, to prices that look cleaner. You can see above that Alternate Tier 1 in the UK increases the price to £0.99 where the price of Tier 1 is £0.79. Similarly, Tier 1 in Australia is $1.29 and Alternate Tier 1 is $1.99. Most countries are affected by this, but not necessarily for all 5 of the Alternate Tiers, because as you can see, only 3 of the UK Alternate Tiers offer different prices. The US prices do not change in the Alternate Tiers. 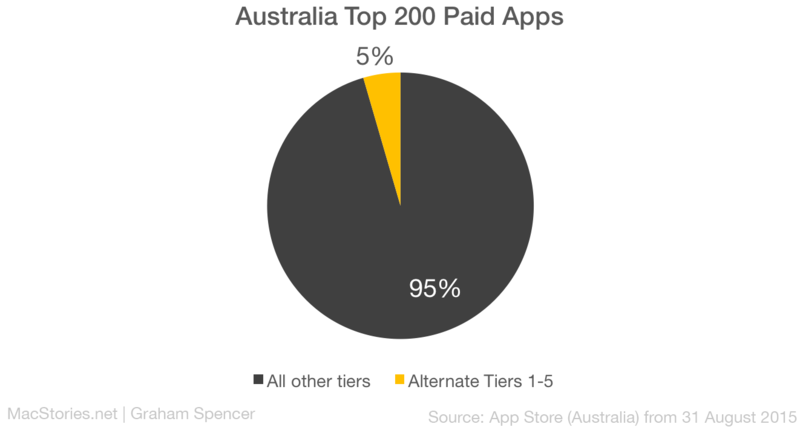 Despite the high adoption of Alternate Tiers A and B for those successful apps which hit the China top paid charts, the same cannot be said for Alternate Tiers 1-5 in Australia, where just 9 of the top 200 paid apps in the Australian App Store use them. Are the Alternate Tiers Useful to Developers? I was able to speak to Hosam Hassan, developer of apps including TodoMovies and Themeboard, and Andreas Amann, developer of GV Connect. Both Hosam and Andreas use Alternative Tier 3 for some of their apps. As to the effectiveness of adopting one of the alternate tiers, Andreas doesn't think it has made any noticeable change, but decided to adopt it because the prices is cleaner and more consistent. Hosam is only a little more positive, telling me that the result "is a very tiny increase in revenue but better than nothing". So there you have it, that's an introduction to App Store Price Tiers. On the surface it's a quite a simple system, but when you delve a bit deeper into how it operates, there's quite a lot of detail that Apple has implemented. The more recent additions of Alternate Tiers in particular should be something that any developer that is selling content on the App Store should be aware of, particularly in the context of emerging markets such as China where they are hugely popular amongst the top-charting apps. Thanks to Hosam and Andreas for answering a few of my questions. I'd like to hear from other developers as well, so if you've adopted one of the Alternate Tiers for your app and have seen an impact (good or bad), please get in touch on Twitter or email.